Moliére's anticlerical comedy Tartuffe is the unique prism through which Sheryl Kroen views postrevolutionary France in the years of the Restoration. 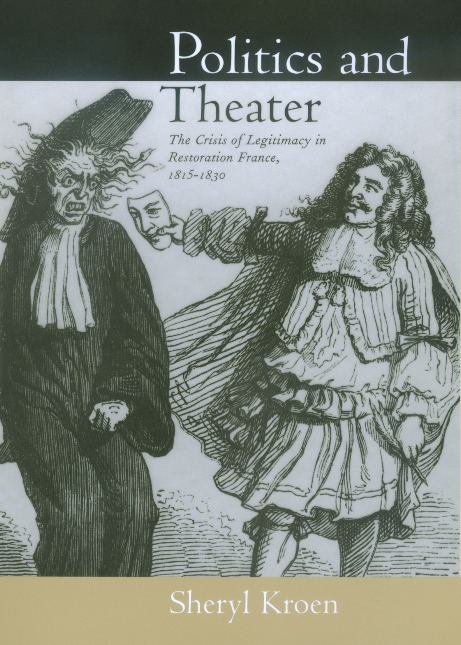 Following the lead of the French men and women who turned to this play in the 1820s to make sense of their world, Kroen exposes the crisis of legitimacy defining the regime in these years and demonstrates how the people of the time made steps toward a democratic resolution to this crisis. Moving from the town squares, where state and ecclesiastical officials orchestrated their public spectacles in favor of the monarchy, to the theaters, where the French used Tartuffe to mock the restored monarch and the church, this cultural history of the Restoration offers a rich and colorful portrait of a period in which critical legacies of the revolutionary period were played out and cemented. While most historians have characterized the Restoration as a period of reaction and reversal, Kroen offers convincing evidence that the Restoration was a critical bridge between the emerging practices of the Old Regime, the Revolution, and the post-1830 politics of protest. She re-creates the atmosphere of Restoration France and at the same time brings major nineteenth-century themes into focus: memory and commemoration, public and private spheres, politics and religion, anticlericalism, and the formation of democratic ideologies and practices. Sheryl Kroen is Assistant Professor of History at the University of Florida.